476: melissa squared and a free pattern! The first of my customers to receive her quilt back from me after longarming it was the lovely and talented Melissa Peda of 100 Billion Stars! In addition to making her own quilts, Melissa sews sample quilts for Westminster's booth at Quilt Market. This was a quilt of her own design using primarily small pieces of various Westminster fabrics (both Rowan and Free Spirit). 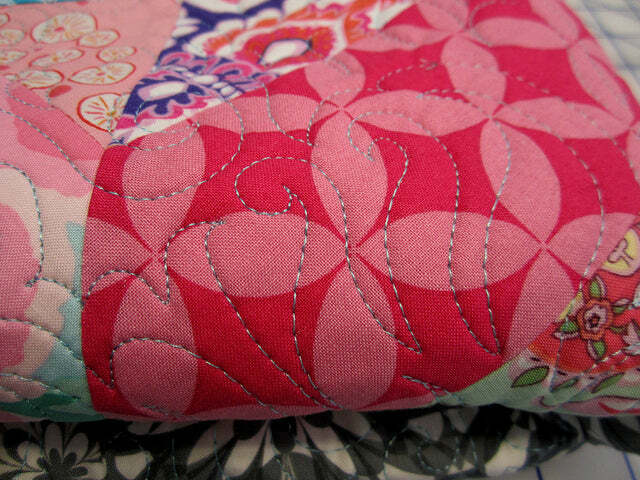 See link below to grab a pdf of this free quilt pattern called Roundabout! I was thrilled when Melissa told me to just have fun with it and do my 'Melissa Freestyle Stitching' which is an allover mix of designs. That is the most fun for me--- it is pure improvisational and intuitive play! Drawing with thread--- it is so rad you guys. I think this is my 8th customer quilt. I love longarming! I chose a sky blue thread because there was a lot of blue in the quilt already. I like how it blends with the blue fabrics but pops on and adds blue to the other fabrics. I bought a bunch of Glide by Fil-Tec (awesome colors!) and I love it. It has such a nice sheen and it doesn't fill the bobbin with lint and make it all fluffy like a cotton candy machine! When Melissa got her quilt in the mail, she emailed me this,"I got the quilt today! Woo hoo!!!! It looks amazing! Thank you so much. 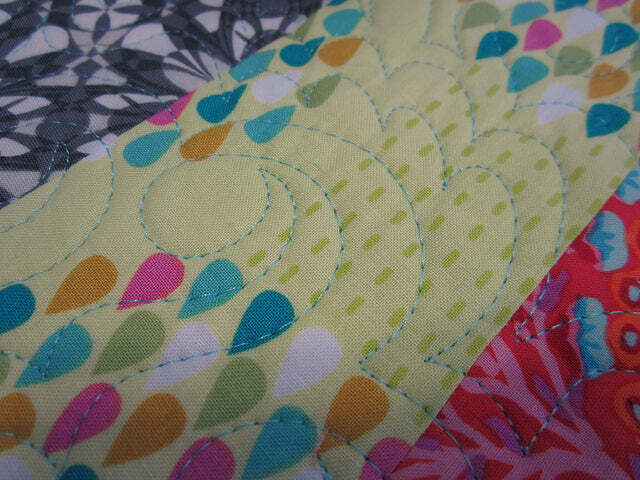 I love the "Melissa Freestyle" quilting and the thread color is perfect." This makes me so so happy!! 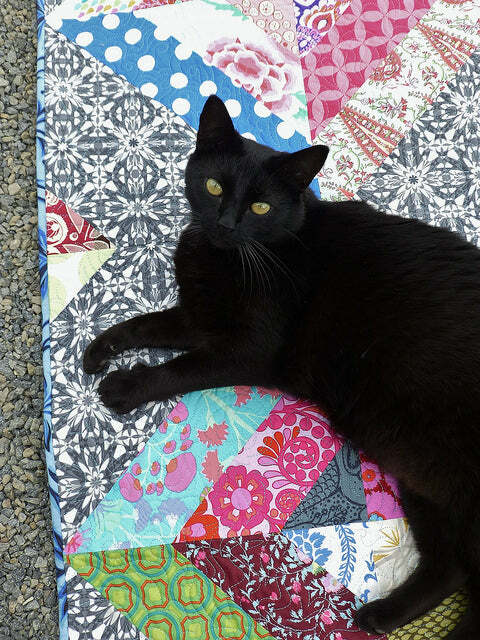 Melissa bound it immediately and sent me this picture, saying the quilt was Cat Approved! Huge thanks to Melissa Peda for being one of my first customers, for believing in me and for letting me have my way with her beautiful work! Head over to her 100 Billion Stars blog to grab a copy of the free pattern for this awesome Roundabout Quilt and read her post on our collaboration! You guys, I love doing this.